Wine tasting is an inexact science. We professional slurpers talk in generalities rather than specifics. That’s why terms like ‘nutty’ crop up so often in tasting notes. The same goes for fruity, minerally, toasty, buttery, spicy and so on. It’s no coincidence that all these adjectives end in ‘y’ by the way, for they are all constructed from nouns, the names of substances you can actually imagine in your mouth. Should we be more precise when it comes to our nuts? Maybe. After all, a recipe that treated almonds, walnuts, hazelnuts and coconut as interchangeable would be laughed off the food pages. In a wine sense, too, there are significant differences between these flavours: each is indicative of a different wine style. I associate almonds with two types of wine: comparatively neutral Italian whites such as Frascati, Orvieto and Soave, and (in roasted form) old Amontillado Sherry. I won’t go into the complex chemical process that produces this nuttiness in Sherry – partly because I don’t understand it, and partly because it would put you to sleep – but the longer Sherry spends in old wooden casks, the stronger the nutty character seems to become. You can also find it in Oloroso Sherries, albeit in a less pure form. The smell of coconut – the whiff of a Bounty Bar – I associate with oak ageing, especially in American barrels. It’s a characteristic that crops up a lot in bottles of Australian Shiraz and Spanish Rioja, as well as in cheaper New World whites and American Zinfandels. At its best it marries beautifully with the wine; at its worst it can seem sweet and confected. French oak, the vessel of choice for most of the world’s top producers, never smells of coconut, by the way. 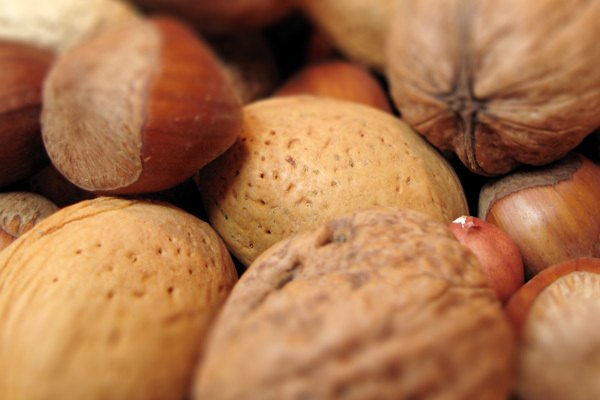 You should be wary of the smell of one particular nut in any vinous context. The aroma of walnuts, especially mouldy ones, should set your palate’s early warning system buzzing like a demented beehive. Why? It’s a pretty strong clue that the wine is corked. And if it smells of hazelnuts and walnuts? Simple. A corked white Burgundy.